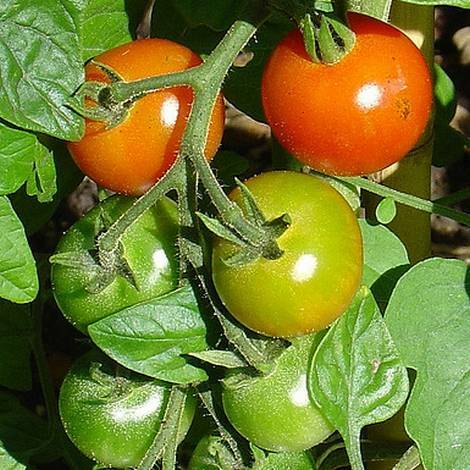 The tomato Solanum lycopersicum is native to South America and is a member of the nightshade family of plants. Following colonization of the Americas, the Spanish introduced tomatoes to many of their other colonies such as the Philippines and the Caribbean islands. They also introduced the plant to Europe, where it flourished and quickly became a mainstay of many Mediterranean dishes. Today the tomato is grown throughout the world and over 130 million tonnes are produced commercially per annum. There are at least 7,500 different varieties available and tomato plants bear fruits ranging in size from two-tenths of an inch (5 mm) to 4 inches (10 cm) in diameter. Although most types of tomato fruits are red, other colors are fairly common, especially yellow and orange (other fruit colors include white, pink, brown, black and purple). Depending upon your location you may choose to grow your tomatoes indoors, in a greenhouse, or outdoors. If growing outdoors it is best to begin the plants indoors and transplant outside once soil temperature has reached 15°C (60°F). Plan to start off your tomatoes about eight or nine weeks before you expect the soil to reach this temperature. In many temperate regions the ideal time to sow tomato seeds is March through to April. Initially you should fill a three inch (8 cm) pot(s) with a soil mix (see below) or compost, firm it with your hand, and then water the soil in the pot. Sow the seeds thinly on the surface. Next spread a thin layer of vermiculite on top of the seeds to cover them. The pot(s) should then be placed into a warm draft free area, an airing cupboard is ideal for this purpose; be sure to keep the soil moist. Once seedlings have emerged, the pot(s) should be transferred to an area of light such as your windowsill (do not put into a place of direct sunlight as this may result in scorched leaves) or the greenhouse. Nb. You will find that most tomato seeds germinate so you only need to sow a few extra seeds more than the number of plants that you require. It is best to sow seeds in a soiless potting mix and then transplant the tomato seedlings into an ideal growth medium at a later stage; this should consist of 50% soil (clay or sandy), 35% peat moss and 15% compost. Studies have shown that tomatoes growing in a mixture that is 70% soil and 30% compost tend to under perform. As tomato plants do not thrive competition it is best to transplant seedlings into individual four inch (10 cm) compost pots once they have reached the two leaf stage. After around eight weeks growth the tomato plants will be ready to be transferred to their final location, be it outside or in the greenhouse. Transplant when they are about 6 inches (15 cm) in height. Ideally the area where you plan to grow the tomatoes will be in the warmest part of the garden, this is often close to a wall where the heat of the house will help to keep the soil warm. It should also be in an area of the garden that receives plenty of sunlight. Before you transplant you should drive a stake/cane into the ground about 2 inches (5 cm) from where you plan to grow the plants, this will be used to support the plant as it grows. As the plant grows it will require support so tie it to the stake/cane at about four inch (10 cm) intervals. With the exception of bush tomatoes you should plan to grow your plants as a single stem; to do this you should cut or snap off shoots that grow out of the stem/leaf joints. Once the plant has produced four sets of flowering trusses you should cut off the growing tip of the plant. This will allow all of the plants energy to be directed into flowering/fruit growth. Tomato plants are thirsty and hungry; they should be watered daily and it is important to fertilize them once a week with a tomato specific fertilizer to ensure that the plant gets enough nutrients to produce high quality fruits. 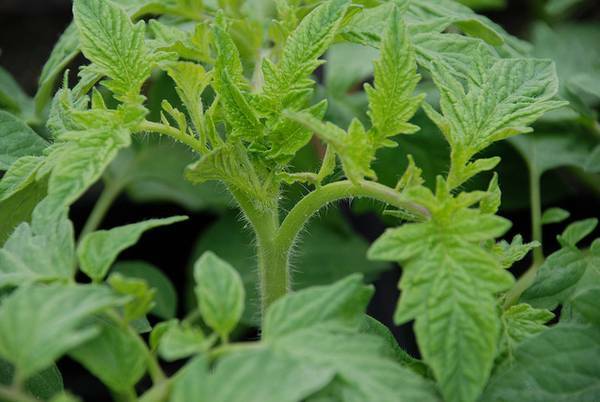 Tomato plants are able to both cross and self fertilize. In Ideal conditions the presence of bumble bees and summer breezes will ensure that tomato flowers get fertilized and bear fruit. However if you live in an area with little wind and few bumble bees, or are growing tomato plants in the greenhouse then you may want to help with the fertilization process. The best way to do this is to mimic the vibration of a bumble bee by using an electric toothbrush or razor (blade removed of course). Hold the toothbrush next to the stem at the base of the flower and vibrate the plant. Alternatively you can help the fertilization process along by using a small soft bristled brush, shaking the plants, or mimicking wind by blowing on the plants. For best results do this three times a week during the flowering period. Tomato fruits tend to ripen from the base, this means that with some varieties of tomato you may need to harvest before the top of the tomato has ripened as the bottom may become over ripe. Ideally you should harvest the tomato when they have an even glossy color throughout, and have a texture intermediate between firm and soft. The time to pick the fruit is often down to individual preference. To remove the tomato, grip it firmly in your hand and twist it until it snaps away from the vine; alternatively you may remove it by cutting off the stem close to the fruit. About six weeks before the end of the harvesting season it is important to remove the tops of the tomato plants. Look for tomatoes about the size of marbles and cut off at this point. These will not have time to mature and it is better to aim the plants energy towards the tomatoes that will mature in time. 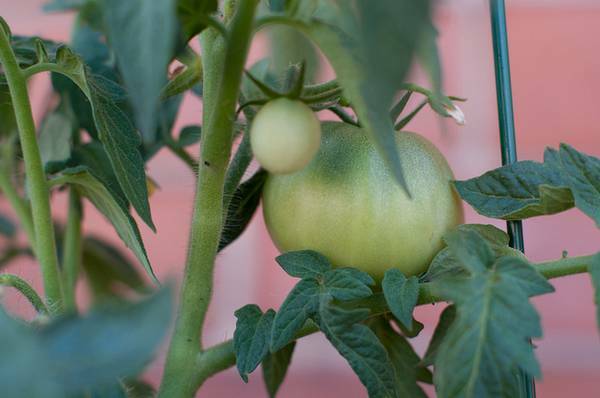 Be sure to leave a couple of leaves above the last tomatoes, this will act as shade for the growing fruits and prevent them being damaged by the sun. Towards the end of the season you will most likely find yourself with many green tomatoes that will be unable to ripen due to a change in the weather; tomatoes will not ripen if the temperature is below 15 degrees Celsius/ 60 degrees Fahrenheit. To ripen these tomatoes you can try to place them on a windowsill, alternatively you can make use of the plant hormone ethylene. To do this place the tomatoes in a draw with a ripe banana. The banana will give off the gaseous hormone ethylene which will stimulate the tomatoes to ripen. Unripened green tomatoes by gkdavie. Ideally tomatoes should be kept at room temperature as this will give the best flavor. A tomato harvested at its peak will last for about two days at room temperature before becoming over ripe. You can prolong the life of a tomato by keeping it in the refrigerator. To help to retain flavor place the tomatoes in the part where you normally keep the butter as this is the warmest part of the fridge. Tomatoes can also be frozen either green or ripe. It is best to either cut them into quarters (to prevent them splitting), chop them, or to make some sort of sauce out of them before freezing. As it is not a good idea to keep thawing and refreezing frozen foods you should place the tomatoes in numerous freezer bags, each containing the expected serving size. If you are planning to grow tomatoes in a lit and heated greenhouse (nighttime temperature should not drop below 60°F (15.5°C)) then you can choose either a one or two crop approach. If you are planning to grow one crop of tomatoes in you greenhouse then it is best to sow seeds into individual pots in the middle of September (after the heat of summer). Transplant seedlings into grow bags, buckets or into rock wool after 6 weeks. You should be able to harvest you plants from Spring to early Summer. To lower the risk of disease and pest infection you may choose to sow seeds a little later (mid November) and transplant in January. This will result in a smaller harvesting season, but in healthier plants. Sow individual seeds in pots for the autumn/fall harvesting from mid to late July. Do not sow any earlier than this as you do not want your plants to receive extreme heat. After six weeks transplant the seedlings into grow bags. The tomatoes should be ready to harvest around the start of November. The second crop (for Spring harvest) should be sown from mid to late November, transplant seedlings into grow bags at the start of January, and harvest from March until June. It is important to grow seedlings in a separate area to where you keep your mature tomato plants, this will limit damage caused by pests such as leafminers, aphids and whitefly. Growing the two crops to this schedule helps to lower the incidence of leaf and grey moulds. If you intend to grow tomatoes in a grow bag specially designed for the purpose then be sure to prepare it prior to transplanting your tomato seedlings into it. You should first shake the bag up, and give it a kneed to break up any clumped up soil. Then shape it so that it is slightly higher in the middle with a hummock like shape. Next make some holes on the bottom of the bag for drainage. Turn the bag over and cut out square holes where you plan to transplant the tomatoes. Tomatoes can be transplanted into a grow bag after about six weeks, or in an ideal world once their first flower truss has appeared. To transplant, first scoop out the soil, making sure that there is enough room that the root ball of the tomato comes below the top of the plastic. Put the plant in and give it a light covering with the compost and water well. Provide a cane/ grow bag support and stake the plant every four inches (10 cm) of growth. Tomato plants need light, ideally 14 to 16 hours a day. Therefore if you are growing them in a greenhouse be sure to give plants extra light when the day length is short, Ideally the light source should be kept close to the growing seedlings.